The basic Japanese tree forms have evolved over the years as a way of categorising bonsai and also helping to establish basic guidelines for styling trees. These form definitions are helpful to the beginner to help develop an eye for different tree shapes and to help define different trunk and branch patterns. It is very useful for the beginner to start his or her bonsai styling education by learning these basic forms. However, once learnt, the enthusiast must not make the mistake of being bound by these definitions either. In many textbooks, the following forms are described as bonsai styles, however there is a strong movement, instigated by Walter Pall, to make a distinction between the form ( according to the predominant feature or direction of the trunk) and the style (the manner in which the form is displayed), and for this reason this article follows this re-categorisation by listing bonsai forms. In summary: The form describes the basic shape of the tree as defined by trunk, the style describes the the way in which the tree has been styled (for instance windswept, near or far away from the viewer, naturalistic or abstract). This is a list of the basic bonsai forms but is by no means a complete list of all bonsai forms or the many variations of the different forms that exist. This form is the most commonly seen in Bonsai and in nature. It can be used for most tree species. The trunk can twist, turn and change direction with a number of bends along its length though the growth is basically upwards. Branches tend to emerge from the outside of bends. Branches emerging directly from the inside of bends often look awkward.The overall silhouette of an informal upright is often irregularly triangular but does not have to be. Coniferous species such as Pines and Junipers are often seen with largely horizontal branching and clearly defined ‘clouds’ of foliage. Deciduous and broadleaf species such as Elms, Maples and box should have predominantly naturally ascending branching and should not have clearly defined foliage pads; a too-common mistake is for deciduous species to be styled with horizontal branching, clearly defined foliage pads and ‘pompoms’ of foliage. In this form the trunk is completely straight and upright. Previously a popular form but now rarely seen as the majority of upright trees have some movement that make them informal uprights. Ideally the trunk should display an even taper from base to apex. This form replicates trees growing unimpeded in open growing conditions without competition from other trees. The branches leave the trunk alternatively from left to right to back and no branches face the front until the top third of the tree. All the branches will be mainly horizontal or slightly drooping as if weighed down by snow in winter. This can be a difficult form to carry out convincingly and it is recommended that only trees with a naturally straight trunk be used. The silhouette of a formal upright is triangular though not strictly symmetrical. Deciduous species are unsuitable as formal uprights. 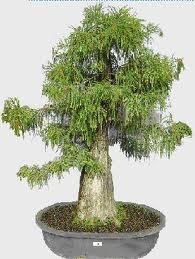 Coniferous species such as yew, swamp cypress and cryptomeria make good candidates. The broom form replicates the way many deciduous trees grow in nature given ideal growing conditions with no competition from other trees. It is particularly recommended for fine branching species particularly Ulmus and Zelkova but all deciduous and broadleaf tree species are suitable. The broom form is not suitable for coniferous species including pines and junipers. The broom form can be further divided into two types, the formal and the informal broom. The best known broom form has a main trunk that divides at a certain point into three or more branches of roughly equal thickness which grow out diagonally upwards from the central trunk. The silhouette of the tree resembles an upturned Japanese broom ; hence the name. 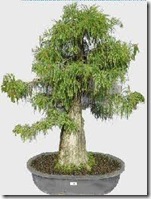 The main trunk of the formal broom tends to be 1/3 of the overall height of the bonsai. There are no horizontal branches; all branching is placed diagonally in a fan-shape with no, or very few, crossing branches. There are variations of the classic formal broom; there can be a main trunk that runs from base to apex of the tree. However, unlike a (in)formal upright, the branches are nearly as thick and dominant as the central trunk, but all of these branches are placed at upturned diagonals from the main trunk, forming a broom silhouette. There is no reason why a trunk without a straight trunk cannot be used for the broom form; a trunk with bends or movement is simply an informal broom. Quite possibly the most common form of broom seen in nature.